"One of my best friends has a birthday coming up, so I thought I'd make her a choker. 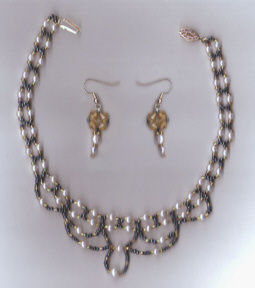 I used shiny black seed beads, silver-lined gold seed beads and Japanese simulated pearls for the choker. I designed the earrings using all the beads I just mentioned, with the addition of gold faceted glass crystals." I think Thu's friend is a verrry lucky woman! 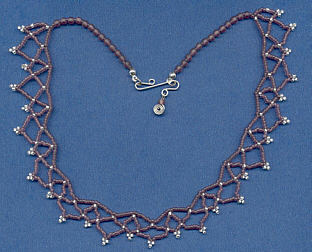 Close-up of the great closure on Jill's netted necklace. 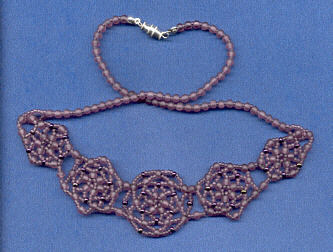 This lovely piece is Jill's interpretation of the netted necklace tutorial. She wrote, "For such a complicated looking necklace it was really quite simple to do when broken down the way your instructions are in your tutorials." 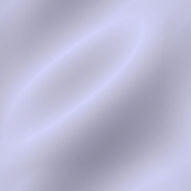 She used matte purple czech and matte frost MillHill. 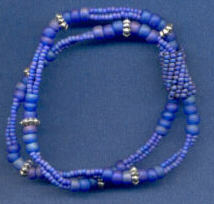 The blue bracelet was Jill's very first try at peyote, using the stretchy bracelet tutorial. She says, "I used different sized beads, so the peyote is lumpy - would plan ahead next time so as to avoid lumps." 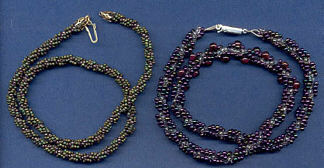 She used Czech seedbeads and pewter spacers. I say, I think it looks fine...lumps and all! Here's what she said about her spirals - "I love the spiral stitch - the possibilities are truly endless. I made a few as gifts, and everyone really liked them. Something very elegant about the spiral. Used MillHill sb's ... I bought two different mixes of greens accidentally, but just mixed them all together. The purple is oilslick and clear sb's and garnet accent beads." And last, but not least is her gorgeous interpretation of Cecile's Wheel. She wrote of this one, " I really love the way this turned out. I made every mistake in the book on this one - accidentally cut it apart, counted wrong, redid the "arms" about 4 times before I decided what to do - you name it - I did it." She used Czech glass purple beads, and dark purple oilslick seeds. Hey, Jill, all that effort, and trial and error were well worth it! You did a beautiful job. I know it will inspire someone else to keep trying!